Callie Granger Penn stands as on of Bristol’s best female athletes ever, having grown up in a sports-minded family. 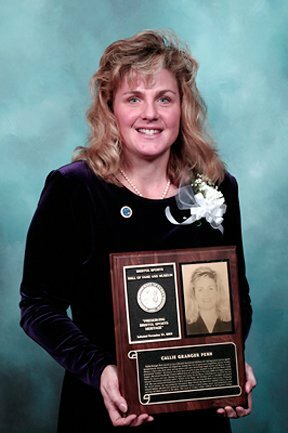 among those who helped her develop this love of sports and competition was her brother, Shawn, a hero who died while saving others who were swimming rough waters off Mexico. A self-proclaimed “tomboy,” she became one of the first two girls to play baseball in the McCabe-Waters Little League. She joined the Bristol Central softball team as a shortstop in the early 1980s and began pitching before the season was over. During her four year career for the Rams, including one in which she was selected Connecticut scholastic sport’s “Athlete of the Week,” she finished with a 1.08 ERA and batted .415. She was named All-Conference on three occasions while earning All-State status twice. Following her senior season, she was picked for Carnation High School All-American softball honors. An all-around athlete, she also won numerous scholastic honors in field hockey, soccer and basketball, twice earning All-State honors in the latter. She went on to play college softball at Springfield College.